"The one that got away! "...whether it be a fish, job, love, or a story, that's something guaranteed to haunt you. Ages ago I heard a story about a peacock. It was a pourquois tale, one of those stories that explain how something came to be the way it was. Today's story isn't the one I vaguely remember, but it's a keeper anyway. I can just picture ending that story with a peacock feather fan or at least bringing out a peacock feather. Today's story came from "Tell It Again" Stories, a book by Elizabeth Thompson Dillingham and Adelle Powers Emerson. The entire book is available at Archive.org. There are holiday stories there, including "A Halloween Story", which you can find on YouTube as an audio story. The photo of a jack-o-lantern there gives away the obvious story ending, but it would make a good story to start with a large pumpkin shape and then cut out the parts, possibly inserting either a cat puppet or a cat cutout. That story isn't even one of the best in the book, in my opinion, but the book gives clues to the authors having connections with Kindergarten Magazine and other material aimed at very young children, so it's a good choice for somebody seeking a gentle Halloween tale. The holidays also include three for Christmas, a Valentine tale, and a pair of patriotic stories, one of which I'm eager to bring here for my Fourth of July selection. Beyond the holidays there are various nature and animal stories, adaptations of stories like Cinderella, Arthur and the Sword, Noah and the Ark, Moses in the Bulrushes, the Midas Touch, two stories from Longfellow, all 42 simplified and condensed for an introduction to the youngest listeners, and, of course, even more. 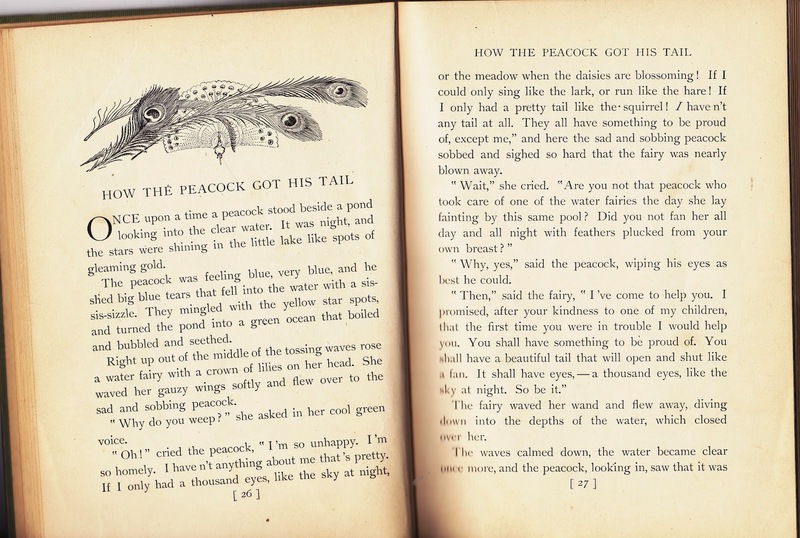 Both Dillingham and Emerson and other selections from different authors in the collection often were published in children's magazines, but are otherwise fairly anonymous, although a Plymouth Colony resident also was named Elizabeth Thompson Dillingham. Slightly more is known about Adelle Powers Emerson as RootsWeb states: I have an old high school photo of Miss Adelle Powers Emerson. She was the daughter of William and Clara Powers Emerson. She was born January 1879 in Orland, Maine. By 1900 they had moved to Worcester, Mass. The book's copyright registration from 1911 is for Worcester and the authors dedicated the book to "our fellow kindergartners of Worcester and the little children under their care." Some of the material seems beyond today's kindergarten students, but it's worth a look when seeking material for young children and beyond.